Not everyone thinks of caring for the caregivers, but a volunteer team at Fayetteville Christian Church did. A team of volunteers from Fayetteville Christian Church recently contacted the volunteer coordinator at Christian City senior care facility in Union City and made arrangements to provide a brown bag lunch with homemade chicken salad sandwiches to staff members on all three shifts at Christian City’s Assisted Living Center and Skilled Nursing and Rehabilitation Center. 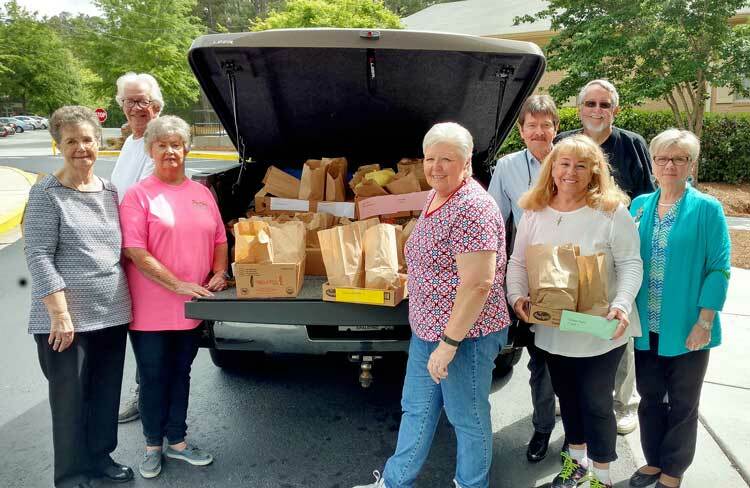 Unloading lunch, from left: Helen Thornton, Dean Laffan, Audrey Bates, Barbara Enright, Larry Etheridge, Linda Etheridge, Brian Enright and Christian City Volunteer Coordinator Connie Hall. Photo/Larry Regier.